This article looks at the increasingly popular phenomenon of Ninas in crosswords. The concept of Ninas comes from the American caricaturist Al Hirschfield (1903 � 2003), who was in the habit of hiding his daughter�s name, Nina, in his pictures. You can read more about him here. In crosswords a Nina is a hidden message which appears in the grid, but is not indicated in any way by the clues or a preamble. Ninas often appear at the edges of a grid, if those edges consist of unchecked letters; sometimes it will run round the whole perimeter of the grid. At ot her times the Nina may be spotted in horizontal or vertical columns of unchecked letters. You can see this illustrated in the example grid on the left. We have MONTY PYTHON�S FLYING CIRCUS (in blue) running anticlockwise around the grid; BLAZING SADDLES (in red) running down columns 3 and 13, and BASIL BRUSH (in green) in rows 7 and 9. Such a grid with three Ninas is unfillable � it is simply to show where you�re most likely to find them. Ninas can also appear as actual answers in the grid. The first example I remember of this was many years ago, when I used to do the Telegraph cryptic. Someone pointed out to me that the first two across answers of the quick crossword were always linked pairs of homophones such as KNIGHT/MAYOR or COLLIE/FLOUR. After that I always used to do enough of the quick puzzle necessary to get the first two answers, and I was full of admiration that the setter could think one of these up every day. What is the difference between a Nina and a theme? That�s very much a matter of opinion. My own is that it is (or should be) possible to solve the puzzle without even noticing a Nina. Judging by the comments on message boards, Ninas pass quite a few solvers by (me too, sometimes). A couple of linked answers or a message hidden in the unchecked letters clearly satisfies this criterion. But what about a puzzle in which, for example, book titles are spread about the grid but not indicated as such? Perhaps GREAT and EXPECTATIONS appear in different places in the grid, along with OLIVER and TWIST, BLEAK and HOUSE, and DAVID and COPPER and FIELD, but all of these are clued as words in their own right with no reference to Dickens. It�s still possible to solve the puzzle without seeing the connection, which suggests a Nina, but there�s so much going on that such a puzzle surely deserves to be considered themed, even if the theme is an unstated or �ghost� theme. I would say that the same applies to a puzzle in which all the clues� surface readings have an obvious connection: that is a theme too. Here�s an example. I was very honoured to be asked to write a puzzle for the Independent to celebrate the 200th anniversary of Wagner�s birth in May 2013. I may have been the only setter on the Independent team with a Wagnerian pseudonym at the time, but there were (at least) two other fellow setters who know and love Wagner, and either of them could have done an equally good job as I did. I rejected the idea of Wagner-related answers early on, as (a) his operas� names are very long (like the operas themselves!) so are hard to fit into the grid and (b) I am aware that some solvers grumble if anything more than the most rudimentary knowledge of classical music is required. (Don�t get me started on philistinism in modern times!) So I decided to use a grid in which I could put RICHARD WAGNER BICENTENARY round the perimeter, and the surface readings of the clues were all connected with the great man in some way. The perimeter message on its own would have been a Nina, but taken with the clues, the puzzle became themed. Why do setters put Ninas in puzzles? I can only speak for myself with certainty here, of course. I have put Ninas in puzzles for three reasons: I really want to say something, or I want to give solvers a bit of extra diversion, or I�m bored. Perhaps I should explain the last one first. When I was writing puzzles for an agency, I pretty much had to restrict my clueing to tabloid level of difficulty, and what�s more, I had to use the same 14 grids in rotation over and over again. I�m certainly not ungrateful for the experience I gained, but it did become a bit tedious sometimes, as in essence I was mass-producing puzzles. Sometimes I would try to liven things up by putting messages in the grid, and there were one or two grids which allowed for perimeter messages. After the fascistic smoking laws came into effect in the UK in 2007, I put LIGHT UP DEFY THE SMOKING BAN round the perimeter of one of the puzzles. I never saw more than a few of the puzzles in the final print version, but the editorial process often involved changing clues and answers for no discernible reason, so for all I know the Nina in the published version read something like FIGHT UM DENY THE STOKING PAN. That one was more than boredom though � I really meant it. I wonder if that�s how the linked across answers in the Telegraph started? It�s not hard to imagine a setter finding it stultifyingly dull writing clues like �River in Africa� and �Girl�s name�, and deciding to make things a bit more interesting by finding pairs of words which sounded like another word when combined. We�ll never know, probably. There are more positive reasons for including Ninas, and one of these, as I�ve said above, is to give the solver a bit more of a diversion. I�ll refer back to the example grid at the start of this article. Let�s take Basil Brush. What�s he doing there in the grid? Are we to infer that the setter is a Basil Brush fan? Perhaps that�s true, but it�s more likely that the setter put Mr Brush in there simply because he fitted into the symmetrically placed rows of 5 letters. If the solver�s wondering about it, and maybe remembering those dreadful jokes � Boom! Boom! � the setter�s detained the solver a little longer, and perhaps given him or her some extra satisfaction for noticing the Nina. And what if the solver didn�t see the Nina? It doesn�t matter at all, so long as he or she enjoyed the crossword! I�ve said that the setter really may want to say something when putting in a Nina. I was very touched when Anax included my pseudonyms Alberich and Klingsor as a Nina in a puzzle he�d written that came out on my 50th birthday. Another of my favourite setters, Monk, included a moving tribute to his late dog in one puzzle, and a Nina to celebrate his 100th appearance as an Independent setter in another. This latter puzzle rightly attracted almost universal high praise on the Fifteen Squared site, but one commenter was incredibly rude and made accusations of self-indulgence. Monk's Nina was more than justified, and the crossword itself was superb; in any case, that commenter's mercifully few postings are all spiteful rants against setters, so his comment can safely be dismissed as an example of the trolling that sadly affects all Internet forums. There are times, however, when a Nina can have a detrimental effect on a puzzle, and I�d like to look at that now. Are Ninas ever a bad thing? As already stated, it should be possible to solve a puzzle without even noticing the Nina, and in most cases that�s what happens. A Nina is a bit of harmless fun added by the setter for whatever reason; if you spot it, great, but it doesn�t matter if you don�t. Now that Ninas are relatively common � most of all in the Independent, quite often in the FT, and you get a few in the Guardian too � it is certain that pretty well any Nina will be spotted by someone. Indeed, whenever a setter uses a grid with unchecked letters around the perimeter in the Independent, the feedback suggests that many people look for a Nina, especially when the setter is known for putting them in. No setter would ever be stupid enough to put in a Nina that includes obscenities, extremist political slogans or other offensive stuff; even if they wanted to (and I�m sure they wouldn�t) the editor would pretty likely pick it up. There are other, more realistic reasons why a Nina might adversely affect a crossword and I draw on my own experiences here. A while ago I wanted to include a message that showed my feelings of strong affection for a female friend in Prague in one of my puzzles. I knew how soppy it would look so I had the bright idea of writing it in Czech � after all, the girl in question is Czech and there�s always the chance she�ll learn English, start doing cryptic puzzles and discover how I feel about her� yeah, right. But at least by putting it in Czech I could say what I wanted to say without anyone noticing. So I wrote a message around the perimeter of the grid and started to fill it. My compiling program, Sympathy, makes the tedious task of gridfill pretty easy, but even Sympathy drew the line at filling the grid with relatively common words when many of them had to end in J, V or Z (letters which only score one or two points in the Czech Scrabble). 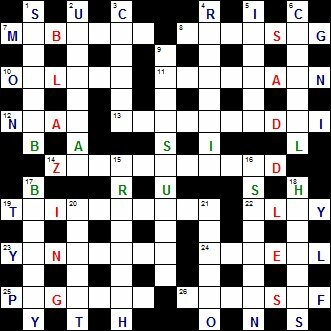 Sympathy did fill the grid, but the result was that many of the words were the sort of thing you�d expect to find in Azed or Listener puzzles, and certainly weren�t suitable for a broadsheet, even in a prize puzzle. I had to give up, though I did manage to create a slightly watered down version which I�ve used on this site. It really would have been self-indulgence to publish such a puzzle in the Independent or FT � always assuming the editors didn�t reject it � and that�s a far cry from the Monk puzzle I�ve mentioned above, which only contained one word likely to be unknown to any crossword solver with a half-decent vocabulary. There have been times that Ninas in puzzles have annoyed me. And I�ll admit, without an ounce of shame, that I�m in no way impartial on this. Let�s say, for example, that I�m struggling through a daily broadsheet puzzle with words like FAUCHION, KYTHE and NAUPLIOID as answers, and worse still, there is a non-dictionary phrase like MY CAT SMELLS and also I�ve had to look up the name of a footballer whose greatest achievement to date is to score two goals for Baku in the Azerbaijan Football League. (I exaggerate deliberately to avoid resemblance to any real puzzles!) I notice that the structure of the grid suggests a Nina, and the weird grid entries point to this, so I assume that the Nina must be pretty special to necessitate such obscurities. Eventually I finish the puzzle and the Nina turns out to be� the title of an album by some bloody pop group from the 1990s about which I know nothing and care even less. I�m going to be pretty narked off. Now let�s suppose that instead of that, the setter�s cleverly managed to include Jenůfa, K�ťa Kabanov� and Li�ka Bystrou�ka (The Cunning Little Vixen), three of my favourite Jan�ček operas, as a Nina in the grid. I can imagine that would make for a horrible gridfill, but in this case I�d quite happily kythe my fauchion and remove all smelly nauplioid creatures from my cat while cheering on the Baku footballer. The point is, of course, that just because I happen to appreciate the Jan�ček Nina and not the pop one, that doesn�t mean everyone else will or should. As I�ve already said, a crossword should be solvable with or without noticing the Nina, and if the Nina forces ridiculous obscurities into a grid, that Nina has to go. Sure, but usually a Nina is just harmless fun? Of course! In the previous section I�ve outlined how Ninas can spoil puzzles, but occurrences of this are relatively rare. There�s nothing wrong with the setter putting in a little extra something, so long as it doesn�t adversely affect the words in the grid. A well-placed Nina can be a lot of fun to spot, and if it�s a heartfelt message conveying sincere feelings of respect, one would have to be a real killjoy to object to that. There�s no doubt that noticing a Nina early on can help the solver, too, in the way that noticing that a puzzle is a pangram (uses all the letters of the alphabet) does. Let�s say you�re halfway through solving a puzzle that has a Nina-friendly grid � with a series of unchecked letters around the outside � and the setter�s known for including Ninas from time to time. You notice that, starting from the top left, the perimeter reads GR_ATMIN_ _TH_ _KA_ _KE. There�s a very good chance that there is a Nina which reads GREAT MINDS THINK ALIKE, and if you pencil that in, and you're right, you�ve got more letters towards the remaining answers. Certainly a Nina which gives you first letters to answers is a bonus, as the first letter of an answer is usually the most useful you can get. As I�ve said, a Nina ideally should be neutral; a puzzle should be solvable with or without noticing it. The solver shouldn�t be expected to look for something that isn�t indicated. And so long as this basic requirement is fulfilled, a Nina is indeed a bit of harmless fun that, if spotted in good time, can actually help the solver. What did Ximenes have to say about Ninas? As far as I know, nothing. The popularity of Ninas in crosswords started well after his time, although there is a touching story about the Times including a Nina in 1967 to mark the retirement of an avid Times crossword fan � read more here on the excellent Crossword Unclued site. Since then, Ninas have appeared in the Times cryptic crossword relatively rarely. When and where do I use Ninas? As I�ve said, I used to stick them into the puzzles I produced for the agency to make things more interesting. Since I finished with them and got a regular gig on the FT and Independent, I very, very seldom put Ninas in my broadsheet puzzles, though the Wagner bicentenary puzzle is a notable exception. It�s not that I disapprove or anything like that � I hope that should be obvious from the foregoing � it�s more that I don�t really feel the urge to include hidden messages in my puzzles. I like to get the gridfill done as quickly as possible so I can get started on writing the clues! The puzzles on this site do contain a few, and they tend to be personal messages or expressions of love or admiration which are fine on a free crosswords site but might be out of place in a puzzle intended for wide public consumption. What�s more, the Ninas in the puzzles on this site have sometimes meant that I�ve needed to use one or two obscurities for the gridfill. I�ve railed above about Ninas which give rise to �dictionary� words in broadsheet puzzles, but I like to think that people who seek out a site like this are probably keen, and therefore reasonably advanced, solvers who are more likely to take such things in their stride and even relish the challenge. I�m sure I�m not the only solver to think I�ve found a Nina because a plausible series of letters has started to appear around the outside of the grid, only to find later that I was mistaken and there�s no message there after all. For example, you might have _THE_ in one place and _NATIO_ elsewhere, and you can certainly be forgiven for thinking that there is a Nina. However, the laws of probability are such that the chances of a coherent phrase appearing by coincidence are very small indeed. That said, I remember that back in my teaching days the younger children used to love wordsearches. I liked them too as they were easy to make up � write 20 or so subject-related words into a grid and fill the rest with random letters. I�d given one of these to a class and after a short time some of them started sniggering. When I asked what the joke was, the kids told me that they�d found the word �crap� and indeed, they were right. Worse still, they had found a far more offensive four-letter word too! I just hope that a similar thing doesn�t happen to me or any of my setting colleagues, but I�m sure it will, one day. Haven�t I gone on long enough now? Definitely. I hope this has been useful for those who are interested in the subject of Ninas!